Imagine a shop ran by a event floral designer, tiki culture fan, someone with a love of 1940's design and pin up girls and you will have just imagined Atomic Sweets. Owned by Michele Q, Atomic Sweets is the place to come when you do not want a boring hair do. Featuring beautiful creations made to make you feel pretty, this shop is truly an eclectic mix of many things that Michele gets inspired by. Made using a lightweight, thin metal headband, hand cut and singed satin flowers this lovely accessory is extremely comfortable. Michele is also open to making you the same design in a different color combination. Just send her a convo! 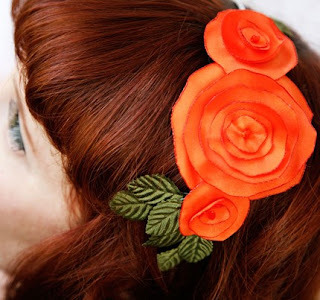 This vibrant headband is made from vintage millinery leaf accents, hand cut and singed fabric flower with crystal beads and a lightweight, thin metal headband. 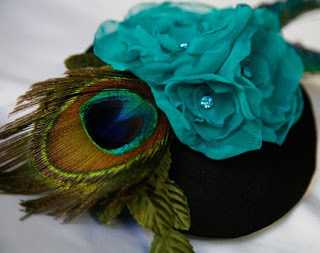 Peacock feather, vintage millinery leaves, turquoise flowers and vintage rhinestones all lead this fascinator to be a true statement piece! It is made with a single prong clip for securing to hair, but can be exchanged for a comb. 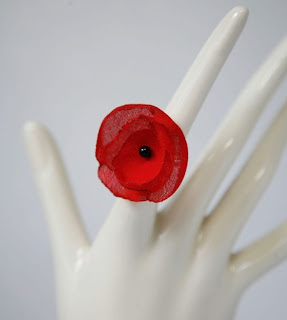 Such a pretty bright red, this could adorn your hand for all of those Christmas parties coming up! First you have to enter though! *Check out Atomic Sweets and let Michele Q know your favorite item in her shop! *If you are a follower or become one of Joy De Vivre you will earn a second entry! The drawing will be Friday and the winner will be announced! Best of luck to you all! Great shop! I love the rings. I think my favorite is the black one. They are whimsical yet delicate. What great shops you've featured. I just hearted some of them. I would love to be featured. Feel free to visit my shop if you are interested. I love everything in this shop! 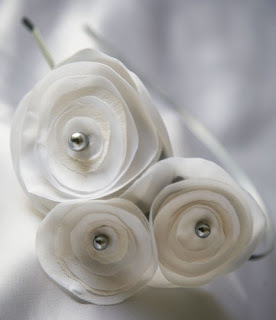 My fave is the white headband featured in this blog! Ohhhhh, what a lucky winner! Those head pieces are divine!